The head of the region Sergey Morozov, general director of Ulyanovsk Region Development Corporation Sergey Vasin and representatives of the Danish company Vestas Wind Systems A / S (member of RAWI) Mr. Tommy Rabek Nielsen and Mr. David Rowen have signed an agreement on investment in construction of a plant for production of blades for wind turbines in Ulyanovsk region. The agreement was signed during “Investor demands-Governmental actions” conference. The project comprises creation of the production of components for wind turbines, namely blades for wind turbines, ” with the prospect of further expansion. 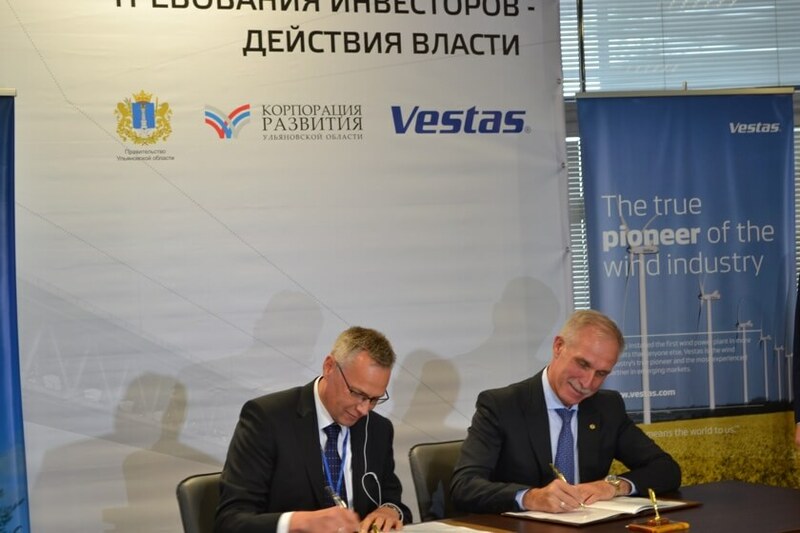 Fortum and RUSNANO have chosen Vestas as supplier of turbines for wind power plants in Russia. It will be large-scale cooperation, including construction of new wind farms in the region already using components that will be produced in the industrial aerospace cluster inthe Ulyanovsk region. Vestas is also planning to launch training programmes to facilitate the skill and knowledge transfer necessary to setup local production. The programmes will be developed together with Ulyanovsk educational institutions. It is to be reminded that шт 2017 on the basis of the Ulyanovsk nanotechnology center (member of RAWI) there was opened the first department “Wind power systems and complexes” in Ulyanovsk State Technical University, as well as the basic department “Technology of wind power”. In September 2017 they have started training future specialists in wind power. Vestas is the energy industry’s global partner on sustainable energy solutions. We design, manufacture, install, and service wind turbines across the globe, and with 85 GW of wind turbines in 75 countries, we have installed more wind power than anyone else. Through our industry-leading smart data capabilities and unparalleled more than 71 GW of wind turbines under service, we use data to interpret, forecast, and exploit wind resources and deliver best-in-class wind power solutions. Together with our customers, Vestas’ more than 22,500 employees are bringing the world sustainable energy solutions to power a bright future. ⟵The first Russian company on the global offshore market – Onego Holding and the Russian Association of the Wind Industry signed an agreement at the Eastern Economic Forum (text, video).